Navratri is a joyous festival which is celebrated every year by Hindus, during early fall season (occurs during late September and early October). The Goddess in the form of the Universal Mother is worshiped for nine nights and hence the name "nava-ratri." On the tenth day, the festival comes to an end with a special puja called Vijaya Dasami. During the ten days of the Dasara festival (ten days and nine nights), it is common for Hindus to read and recite slokas on the greatness of Mother Durga, Lakshmi and Saraswati. 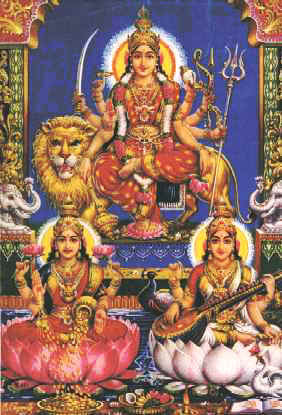 Mother Durga symbolizes the power of purposeful action (Kriya Sakti). Lakshmi represents the will power (Itchaa Sakti) and Saraswati stands for the power of knowledge (Jnana Sakti). Open air stages are usually erected and a variety of entertainments enliven the cool nights. In many parts of the country, notably Bengal, Karnataka, Maharashtra and Andhra Pradesh, clay idols depicting Durga finishing off the wicked demon Mahisha are installed. After the celebrations are over on the 10th day, the idols are ceremonially taken to the nearest river, beach or lake and immersed into the waters. In the northern parts of India, people also read Ramayana during this time because it is believed that on the Vijaya Dasami day, Rama returned to Ayodhya Victorious after killing the evil king Ravana. It is considered *auspicious to start new ventures especially on education and other arts on Vijya Dasami day. It is also common in India to see children start their first music or dance or other educational ventures on Vijaya Dasami. We the human beings are prone to exhibit rajasic qualities like anger and hatred which are the menacing manifestations of Durga Devi to destroy the evil. Our interest in music, arts and knowledge are the pleasing vibrations produced by the power of Saraswathi Devi. The pure qualities which include compassion, love, forbearance and sympathy are derived from Laxmi Devi. When we worship Durga, Laxmi and Saraswathi externally in pictures or icons, they are giving physical forms to the subtle potencies that are within them. It is unfortunate that we fail to recognize the importance of the symbolism behind the festivals and celebrations. We are too quick to go after the material aspects of the celebrations instead of focusing on the spiritual message. We seem to look for remedies from outside instead of looking for the answers inside. We ignore the Divinity within and seek the external objects in search of Divinity. There is no need to go in search of the Divinity outside. We must develop firm faith in the Divinity within and turn our attention inward to experience the True Human Nature. What is that we should do during these days of the Navarathri festival? We direct our Itchaa Sakti to direct our mind toward Divinity within. We apply our Kriya Sakti to conduct Dharmic Actions - unselfish service to the humanity. Finally, we turn our Jnaana Sakti to attain the Divine Self. Hindu Festivals and Celebrations constantly remind us our True Human Nature through symbolic messages. The purpose of the celebrations is not for external pleasures but for inward peace and tranquility.